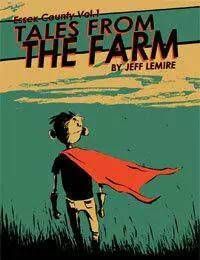 The first installment in Jeff Lemires Essex County trilogy follows young Lester Papineau - a child who doesnt quite fit into the farming life that hes left with after his parents die. Living alone with his Uncle Ken, they struggle to find common ground; Ken has lived the farming life for as long as he can remember while Lester is content to play superheroes. Lester finds a friend in Jimmy Lebeuf, the towns gas station owner and former hockey star. Both feel out of place and broken in the world they live in, and escape into their dreams of heroes, aliens and Canadas favourite sport.